We are just back from a week’s holiday in Mallorca. Getting a tan to top up the feel-good of summer before the winter has us bogged down in heavy clothes and sinking into a more contemplative phase. Hence my delayed write-up on the excellent Thai massage for lower back pain course I attended just before going away. Our group (of thirteen) was the first to attend this workshop. 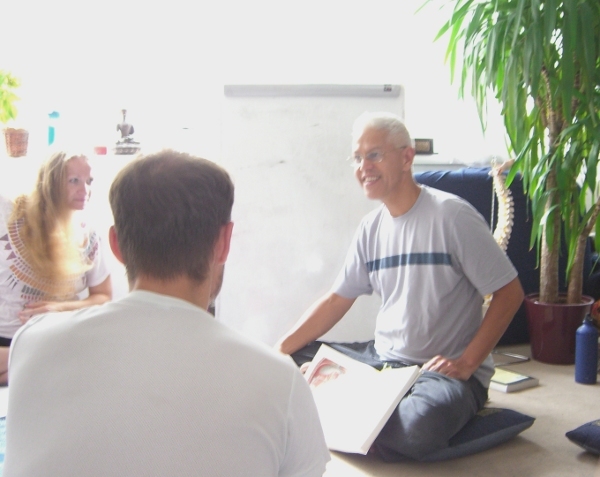 The course was aimed at those with a good working knowledge of Thai massage. So often people come for Thai massage with aches, pains, or serious discomfort in their lower back. The premise of the course was to examine the various causes for lower back pain from both a Western anatomical and and Eastern energy-line understanding. We would then look at Thai massage techniques and bring to them adaptations and additions which come from osteopathic practice. Each day started with a short meditation and some exercises to get us out of the mindset of the busy City life outside (the school is based a stone’s throw from Liverpool Street mainline station) and into a place where we could learn and be mindful of our own and each other’s bodies. We started each section with a talk by Cyprian on the anatomy of the back. This went to much greater level of detail than is covered on the anatomy and physiology courses required by most massage schools and professional bodies. Credit here to Cyprian who had clearly put in a significant amount of work to bring together all the information in a comprehensive course manual. He also discussed the nature of the tissues involved which helped us understand why sometimes seemingly gentle techniques can have a profound effect. The principles of osteopathy and Thai massage intersect in that the idea is to influence the body to initiate its own healing process. Both Ralf and Cyprian would then demonstrate some exercises which could be introduced during a Thai massage to work with the structures and tissues that had been discussed. A practical session might include some work in supine, some in prone and some in side position. There was no attempt for these to form a sequence for treatment at this stage. We then paired up and practised on each other, with expert help on hand to guide us in the details. As the sessions went by we were able to review material from previous sessions, and work with different partners. This was useful for experiencing the touch of several people, and seeing how to implement a technique on people of varying stature, bodyweight and flexibility. The final session was an opportunity to deliver and receive a longer massage treatment. This was our chance to combine what we had learned into a sequence along with other appropriate exercises for that person. Of course, this was the first bringing of everything together and it will take considerably more practice to be familiar with all of the techniques learned and to incorporate them seamlessly into a full massage. I very much enjoyed the course. Thank you to Ralf and Cyprian for the considerable work in putting this all together and presenting it in such a coherent manner. Thank you also to my fellow students, for coming together to create a ‘sangha’ or community, which was such a blessing. The first massage I gave following the course was to someone I’ve been treating regularly. At our previous session there was something I felt I didn’t get to and had to leave unresolved. As a result of the workshop I had a better understanding of what might be going on and was able to incorporate a couple of gentle oscillation techniques to get deeper into the fascia of the restricted area. It really seemed to help, even by the end of the session. I trust Ralf and Cyprian will be repeating this course and I highly recommend it. Ralf mentioned that they are considering more courses focussed on specific issues and I hope I’ll be able to attend those. This entry was posted in Thai Massage and tagged Ralf Marzen, Thai Massage. Bookmark the permalink.